Traditional and modern, actually the same! Below you can find a traditional long division being done in steps. You can also click on the long division itself to go one step forward. Understand the above before you continue with subjects 2 to 4 below. 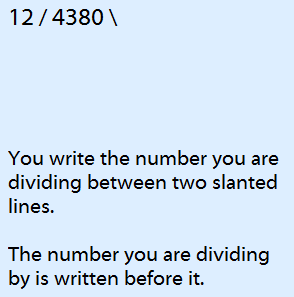 Sometimes, the number you are dividing with will not fit in the number under the subtraction line. This means that the number you are dividing with fits 0 times in the number under the subtraction line. You write a 0 next to the \-line. 9 fits zero times in 4, write a 0 and immediately take the next digit down. What happens when you have a remainder? If your long division does not reach zero at the end, there is a remainder. Writing this remainder as a fraction is the most beautiful solution. The answer for the last subtraction is 5. So you have a remainder of 5. This 5 should still be divided by 8. You can write this as the fraction: 58. You do not write a remainder, but keep taking zeros after the decimal dot. To help yourself, you can draw a vertical line representing the 'dot'. In modern primary education there are different kinds of long divisions used. These are not based on an algorithm like the traditional long division. With the modern long division you also subtract a multiple from the number you have to divide. Because you are free to choose your own multiple, your long division can get very long or very short. There are lots of ways to write this down. Because you can choose the multiples yourself, there are many different long divisions for the same division. If you forgot how you were taught the long division, try to refresh your memory with the examples below. You can also choose to learn the traditional long division above. A remainder works the same as with the traditional long division. When at the end of the long division you still have a number left in which the number you are dividing with does nog fit, there is a remainder. Writing this remainder as a fraction is the most beautiful solution. The answer for the subtraction 79 – 77 is 2. So you have remainder of 2. This 2 should still be divided by 11. You can write this as the fraction: 211. And because 211 × 11 = 2, you can use that in your long division. With the modern long division it is possible to calculate the decimals behind the decimal dot. You can see this in the example below. You will get a remainder of 5 (in the middle of the long division). You first do 0.7 × 7 = 4.9. The remainder will become 5 – 4.9 = 0.1. Now you do 0.01 times 7 = 0.07. Your remainder becomes 0.1 – 0.07 = 0.03. Continuing this will get you more and more decimals. If you subtract the greatest multiple of ten, one hundred, one thousand, etcetera, in a modern long division, you will get 'exactly' the same long division as with the traditional method. Compare the two long divisions below. I also used this principle in the two examples above. So actually you are doing the same thing in both methods. The difference is that with the traditional long division you are leaving out the digits you are not using.